We're in a post "win-win" world. Some 35 years ago William Ury, with Roger Fisher and Bruce Patton, wrote the book 'Getting to Yes: Negotiating Agreement Without Giving In,' re-defining the art of negotiation. The idea of working not as opponents, but allies seeking a similar goal from opposing perspectives, is now familiar to us. But as often as not, it's still a tough row to hoe. In the interim, William Ury has been busy, helping governments, corporations, unions, individuals, in essence, the world work together towards a variety of common goals. He's written a passel of sequels to the original work, fleshing out the ideas and helping readers hone their art as he has done for himself. And that's where the insight arrives. Ury realized that his original book needed not a sequel, but a prequel. Observing his own work, he realized that deep into a tense set of talks, he was as much of an adversary to himself as was the other party. 'Getting to Yes With Yourself' is the prequel he now thinks he should have written in the time before "win-win." 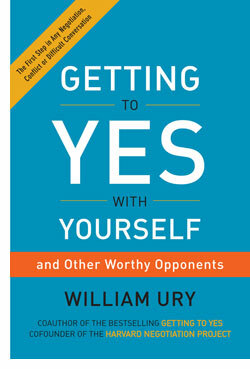 'Getting to yes With Yourself' is short and to the point, but it's also entertaining and chock-a-block with anecdotes from Ury's trials as a world-renowned negotiator. But this is also a more personal book as well, and that's as it should be because he is, after all, talking about ways in which each of us must deal with our own inner opponent. While not everybody needs to negotiate in the way that Ury does, we all need to come to some agreement within ourselves. 'Getting to Yes With Yourself' offers practical advice for doing so. A brief and effective introduction sets the scene for the rest of the book, which is brisk, engaging and efficiently written. The rest of the book divvies up his ideas into six easy-to-follow sections, and illustrates what he's talking about with a wide-range of anecdotes. The anecdotes are an important part of the book. Ury talks about the challenges presented to his daughter, born with a host of medical complications that have played out through her life. He hits the right note of personal passion and involves us in his family, and demonstrates his thinking on a domestic level. We see him negotiating (and flailing) with an angry Hugo Chavez. But he manages to pull back and learn from his emotions. The stories in the book are expertly woven into his psychological insights. Readers will find some familiar ideas re-imagined by Ury and described with an array of apt metaphors and analogies to make them approachable and apprehensible. His six steps are titled "Put Yourself in Your Shoes" (call it mindfulness), "Develop Your Own Inner BATNA" (Best Alternative To Negotiated Agreement), "Reframe Your Picture" (move away from zero-sum and scarcity perceptions), "Stay in the Zone" (be present in the present, not the past, or the future), "Respect Them Even If" (be inclusive), and "Give and Receive" (mine the power of compassion). Each chapter is short, smart, and fleshes out his core concept in a manner that's enjoyable to read and easy to grok. Ury's prose is low-key, and his approach is crisp and to-the-point. Between his entertaining personal stories, his larger story becomes quite clear. We all need to negotiate at some point in our lives. Before we do, we'd best understand and allow for the flaws, the feelings and the strengths of the first opponent and most implacable adversary we face — ourselves. When we've overcome our own objections, when we've made peace with ourselves, we can begin to do so with the rest of the world.